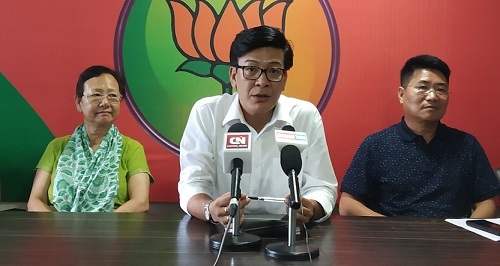 In a major setback to BJP ahead of the Lok Sabha polls, two ministers of the BJP government in Arunachal Pradesh, 12 sitting legislators and the party’s general secretary joined the National Peoples’ Party (NPP) on Tuesday evening. In Arunachal Pradesh, Lok Sabha polls and state legislative assembly polls are being held simultaneously on April 11. While Waii is the state home minister, Jarkar Gamlin is the tourism ministers of the state. Jarpum sent his resignation to party president Tapir Gao on Monday morning. Kumar Waii had earlier told media that he was deprived a ticket as chief minister Pema Khandu thinks Waii as a contender for the chief minister’s post. Jarpum Gamlin and some of his supporters have been camping at the Hotel Taj Vivanta here in Guwahati since Monday night. Meghalaya chief minister Conrad K Sangma met Gamlin and others in the hotel last night. Jarpum and the other leaders, who had joined NPP, returned to Itanagar on Tuesday.